Sitting here at anchor off to the side of of the Intra Coastal Waterway affords the opportunity of studying hull shapes and their wave trains. What we have for you here are several different shapes, each with a unique shape to their disturbance pattern. 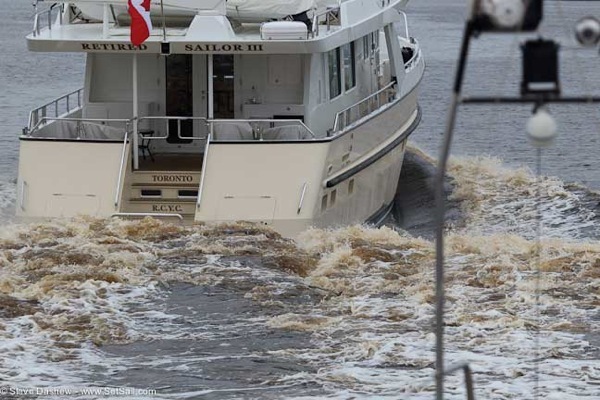 The boat above is about 35-feet long and is throwing a huge wake, not a sign of efficiency! This would be considered a planing design, but looks a bit heavier than would be normal, and must be using brute force to overcome the drag indicated by the waves train. Planing hulls create lift so they don’t get trapped between the bow and stern wave, and theoretically are more efficient at speed length ratios above 1.3 than displacement shapes. The hull above is probably lighter for its length and the wake looks cleaner than the first boat. This would be considered a “semi” displacement configuration. She is traveling at about 12 knots well above what is considered a displacement speed. Note the huge trough between bow and stern waves and compare this to the planing hull shapes. Trough depth aside, this a clean running hull. 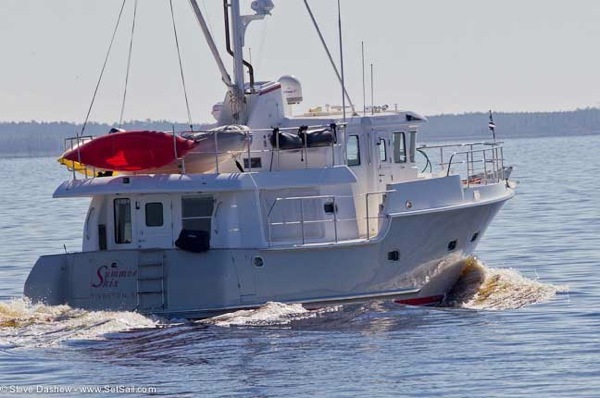 We passed this 43-footer today while heading towards Beaufort, North Carolina. She is definitely a displacement hull, running here at 6.5 knots. Note the hump amidships, not present in the boats above. It could be caused by a volumetric problem with the distribution of buoyancy. Whatever the reason, there are definite drag penalties associated therewith. Finally, the FPB 83, Wind Horse, at 11 knots along the East Coast of Lanzarote Island in the Canaries. Minimal bow and stern waves and almost no hull generated hollow amidships. It is this lack of hollows and distance between bow and stern waves that make the boat so efficient. Lest you think the designer a miracle worker, it should be pointed out that the longer and lighter a vessel, the easier it is to get this result. A last comment for you to ponder. You hear a lot about speed length ratios (a multiple times the square root of the waterline length) with most folks holding to the theory that a displacement hull cannot exceed 1.34 times the square root of the waterline length. We can confirm for you that this is not true. Proper distribution of volume in the hull (block and prismatic coefficients) increases effective waterline length. When you couple this with a longer waterline for a given displacement, magic happens. For example, 300 HP is sufficient to propel Wind Horse at 13.5 knots when she is fully loaded, a speed length ratio of 1.5, and she is not a planing hull. This entry was posted on Friday, October 21st, 2011 at 9:36 pm and is filed under Dashew Logs. Both comments and pings are currently closed. The one in the first photo is a perfect example of a “marina queen”. The design brief usually goes like this: “It needs three staterooms, three heads, a flying bridge, saloon for six, fishing cockpit, and by the way, it has to do 28 knots and fit in a 32′ slip”. So the designer sighs, mutters a few choice words, and comes back with something that fits the marketing group’s demands. He doesn’t care if it’s efficient, because he knows it will only be out a handful of days per summer, and making it efficient would mean expensive, exotic ultra-light materials. I think it’s fair to say that the single biggest factor making Wind Horse so efficient is that she’s longer by half than almost any other yacht with comparable accommodations and comparable displacement. Efficiency comes quite naturally when key dimensions are dictated by physics rather than by marketing. Right on both counts. There is no beating waterline length when it comes to efficiency, as long as the designer and/or owner resists the temptation to load it up. This summer I had a chance to watch SARAH-SARAH move through a slight chop from the dinghy while Sue drove her along at 9.5 knots. It is truly remarkable how little disturbance is created. While in Alaska Brian took some video while we cruised through some quiet water. If he hasn’t shared those with you, you might inquire. Again, astounding. We do seem to get carried away with the “Victory At Sea” photos and video. Speaking of which, Avatar has been caught by a big depression on her way back t o New Zealand, strong gale conditions on the nose for several days, and apparently really big seas. We hope to have video of this at some point, but it would be good t o have more pleasant conditions to balance it out. Take anything Bill Garden says as gospel… he was the master, someone without equal in the field of modern naval architecture. 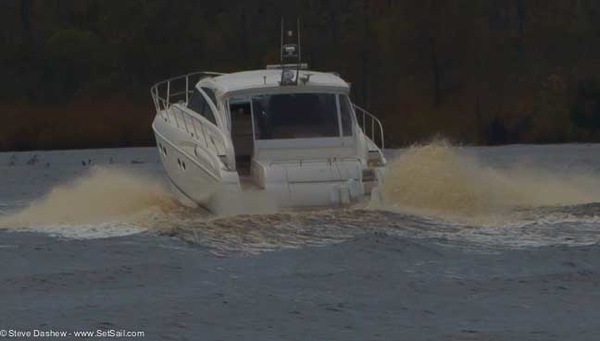 Your discussion regarding speed length ratios is similar to the work of Nils Lucander, namely that changes to hull volume distribution can reduce what he referred to as The Pump Effect to delay and diminish the bow wave and also fill-in the hollow between bow and stern waves to reduce wave making resistance. The distribution of volume of volume is always critical to efficiency, not to mention steering control and comfort. 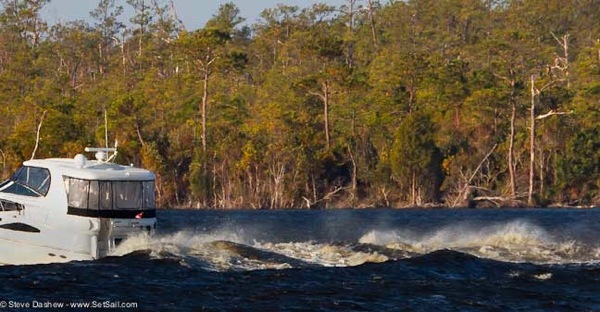 I hope you were using a big zoom lens for those photos; otherwise it appears the ‘captains’ of the ugly & overpowered boats in VA are no more courteous than they are on the West coast of FL. For the most part, they are very accommodating. The lens was typically a 100/400 zoom, usually at about 300mm. Proper distribution of volume in the hull (block and prismatic coefficients) increases effective waterline length sounds an awful like Whitcomb’s area rule for aircraft. While the work of Nils Lucander sounds like a recognition that boats operate in three dimensions and you ignore any one at your own risk. It appears to pitch a lot for such mild sea state. I can’t imagine what it does in heavy seas. To what are you referring with the pitch comment?